HoR spokesperson Abdalla Belheeg reported that HoR head Ageela Saleh has accepted the invitation of newly appointed HSC head Khaled Mishri to meet (HoR). Ageela Saleh, head of the Tobruk-based House of Representatives (HoR), has welcomed the invitation of the newly appointed head of the Tripoli-based High State Council (HSC), Khaled Mishri, to meet for reconciliation talks in the coming days. The revelation was made by the official spokesperson of the HoR, Abdalla Belheeq, on Wednesday. Belheeq added that Saleh accepted this invitation in the interest of ending the suffocating political crisis that the country is going through, which is reflected in the worsening of the situation in the country. This, he explained, was with a view to reaching a consensus that would lead to the amendment of the Libyan Political Agreement (LPA), as approved by the HoR, in the guise of a Presidential Council consisting of a President, two Deputies and a Prime Minister, and to get to include in the political agreement the Constitutional Declaration. Thus, Belheeq added, ending the suffering of the Libyan people, ending the political divide and the division of state institutions – which has led to a deterioration of economic and living conditions. 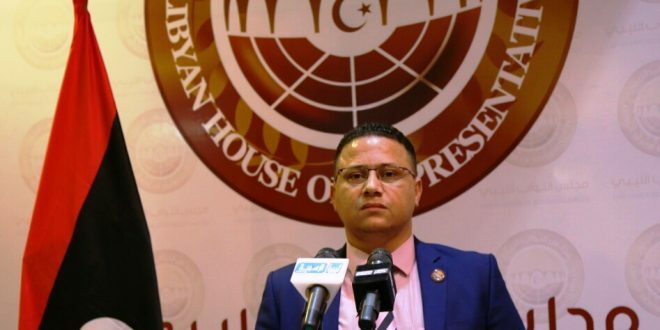 It will be recalled that this week, the new head of the HSC, Khaled Mishri, had called for a meeting with HoR head Saleh in order to attempt to resolve Libya’s political impasse which the country has been frozen in since the Tripoli militia coup in 2014. Mishri, an Islamist member of the Libyan Justice and Construction Party, was selected through a democratic vote as successor to Abdulrahman Swehli last Sunday. The HSC is an unelected body, and was created, as part of the political compromise, out of the rump of the outgoing General National Congress by the LPA signed in the Moroccan city of Skhirat in December 2015. The term of the GNC had ended after being replaced by the HoR in the 2014 parliamentary elections. This, it will be recalled, is taking place with the backdrop of the reported illness of Libyan National Army head Khalifa Hafter.